Leopard Print Garters Official site by Custom Accessories Garters. Custom Themed Garter. Leopard Print Garters are the Stylized Safari Superstars with or without Marabou Feathers on White, Ivory, or Black Lace. 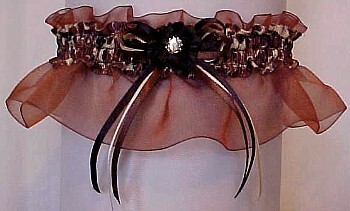 Sheer Leopard Print Garters are as shown and NOT available with Marabou Feathers. 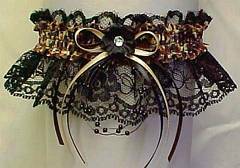 Themed Leopard Garters for Wedding Bridal or Prom are available online at Custom Accessories Garters. Animal Print Exotic Leopard Garters. 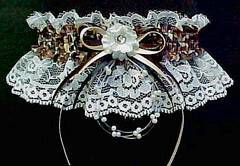 Fancy Bands™ Leopard Garter: Custom Themed Leopard Print Garters on Ivory Lace, White Lace, or Black. 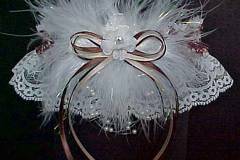 Leopard Garters are available with or without Marabou Feathers. 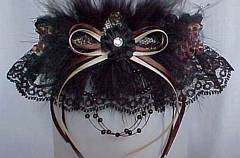 Trimmed with Ivory, Black, or White Floating Pearls, Iridescent Leaves, Triple Satin Bows in complimentary colors, and a Double Floret Flower with a Crystal Rhinestone Eye. Also available in Sheer Leopard Print Garters.